Quantifiers in phrasal and clausal comparatives often seem to take distributive scope in the matrix clause: for instance, the sentence John is taller than every girl is is true iff for every girl it holds that John is taller than that girl. Broadly speaking, two approaches exist that derive this reading without postulating the (problematic) wide scope of the quantifier: the negation analysis and the interval analysis of than-clauses. We propose a modification of the interval analysis in which than-clauses are not treated as degree intervals but as degree pluralities. This small change has significant consequences: it yields a straightforward account of differentials in comparatives and it correctly predicts the existence of hitherto unnoticed readings, viz. cumulative readings of clausal comparatives. 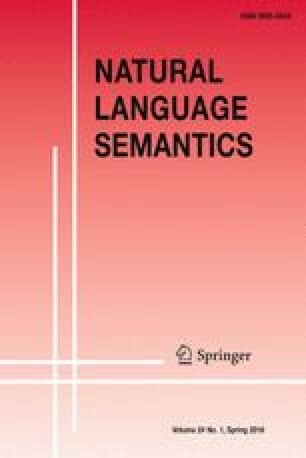 Finally, this paper also makes the case that using degree pluralities is conceptually appealing: it allows us to restrict the analysis of comparatives by mechanisms that are postulated independently in the semantics of pluralities. Davies, M. 2008. The corpus of contemporary american english (coca): 385 million words, 1990–present. http://www.americancorpus.org. Fintel, K. von, and S. Iatridou. 2005. What to do if you want to go to Harlem: Anankastic conditionals and related matters. Manuscript, MIT. http://web.mit.edu/fintel/www/harlem-rutgers.pdf. Heim, I. 2006. Remarks on comparative clauses as generalized quantifiers. Manuscript, MIT. Online at http://semanticsarchive.net/Archive/mJiMDBlN/comparatives%20as%20GQs. Kratzer, A. 2003. The event argument and the semantics of verbs. Manuscript, University of Massachusetts at Amherst; 4 chapters. http://semanticsarchive.net.